For many fly fishers, particularly those frequenting rivers and streams mayflies are the most important insect on their presentation agenda often forming over 50% of the trout’s dietary intake on mayfly rich flowing waters. This popularity has lead to certain mayfly species becoming synonymous with certain rivers and streams within the fly fishing community. A prime example would be the Green Drakes of the famed Henry’s Fork. Belonging to the order Ephemeroptera (short lived winged insect) mayflies have inhabited the planet for over 250 million years. Despite this long term evolution mayflies still remain one of the more primitive insect orders, especially when compared to other aquatic insects such as caddis or chironomids. From a shape perspective mayfly nymphs vary in both size and physique. To further compound mayfly identification, immature nymphs are often confused with other trout prey such as stoneflies and damselfly nymphs. The two adult stages, dun (sub imago) and spinner (imago) appear similar making them easy to recognize. Duns possess opaque wings, spinners feature predominately clear transparent wings. Those wishing to identify specific mayfly species are advised to focus upon the male’s physical traits. Mayflies are capable of thriving in ponds and lakes and rivers and streams with a range of personalities, from rough and tumble to smooth flat and slow. Most mayflies lay their eggs at the surface. The eggs sink down through the water column. Depending upon the time of the year and species the eggs hatch anywhere from minutes to months later. Once hatched, the typically herbivore nymphs begin foraging. The nymphs grow and develop through a series of molts, a trait common to all aquatic insects and invertebrates. 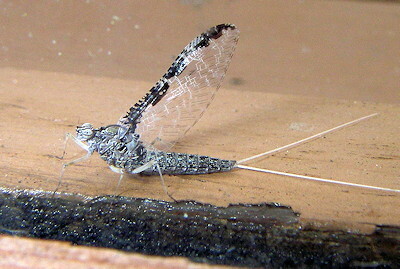 Some mayfly species may molt in excess of 20 times during their nymphal cycle. Water temperature has a profound effect on growth and emergence timing. 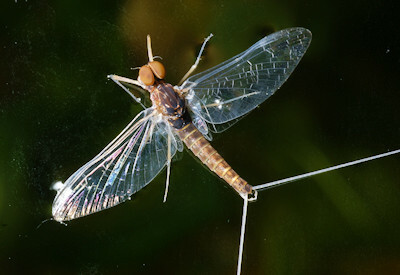 With few exceptions, mayfly nymphs feature 3 tails, distinct external abdominal gills and a single claw at the end of each leg. Observant anglers use these traits to distinguish mayfly nymphs from other aquatic insects. Upon nearing maturity external changes are easily noticed including pronounced wing pads. Just prior to emergence the wing pads darken and swell and fly fishers should focus upon imitating these mature nymphs. Most mayfly species have a 1-year life cycle but there are exceptions. Some of the larger burrower species are capable of multi year nymphal cycles while other typically smaller species such as Baetis (Blue Winged Olive) are capable of multiple broods throughout the season, 2 or even 3 broods under ideal conditions. As mayfly nymphs reach maturity they become increasingly active, darting and moving in view of predatory trout. A number of river and stream species migrate prior to emergence, moving from one region of the stream to another. In these final stages prior to emergence the nymphs begin to physically change. Mouthparts begin to atrophy or harden as the digestive organs are no longer needed. In some cases the digestive tract becomes a storage area for air and gas that is used to buoy the nymph to the surface and aiding the transformation process from nymph to dun. Many species take advantage of cool overcast days to emerge. These damp conditions reduce the risk of dehydration as adult mayflies are not capable of ingesting water. Seasonal timing also plays a role with the strongest hatches occurring during the midday on cooler days. During the warm summer months morning and afternoon are preferred emergence times. Species capable of multiple hatch cycles throughout the season often vary in color as the season progresses becoming lighter to help reflect light and maintain a consistent regulated body temperature to combat dehydration. Geography also plays a role as lower elevation and latitude hatches occur first. The mayfly majority hatches at the surface with the nymphs making the arduous trek from the bottom to the surface. Many nymphs fall victim to trout during their journey and as they hang helplessly at the surface. The emergence process also takes a toll as many nymphs become trapped or crippled during transformation. In selective circumstances trout become fixated on these hapless morsels. Fly fishers are advised to stock their fly boxes with a selection of cripple and stillborn patterns. Trout often take stillborns and cripples with deliberate subtle rises that inexperienced anglers can find tough to interpret. Splashy rises are often associated with prey items that are capable of a quick escape while slower rises are associated with food that is not going anywhere fast. Drifting duns resemble miniature sailboats, their prominent wings held vertically above their backs. Some mayfly species emerge along the bottom or within the water column, the dun bolts toward the surface and freedom. The underrated wet fly is an ideal pattern style for these emergences. Other species crawl from the water to complete their final transformation from nymph to dun. These species obviously offer no opportunity for the trout and fly fishers must focus their efforts upon the nymph or spinner stages. Mayflies surviving the rigors of emergence fly off to shoreline vegetation where the duns undergo a second molt transforming into the sexually mature spinner, on average within 1-2 to days of emergence. A split forms along the back of the dun and the spinner emerges, similar to the transformation from nymph to dun. Adult mayflies are slender and demure. Males are easy to identify by their large compound eyes. Once transformed, the males swarm, often along shoreline margins. Females enter the swarm and mating takes places, mid flight. With their eggs been fertilized, females return to the water to lay their eggs. Trout see far more female spinners so pattern choice and color should reflect this preference including the predominant egg sack at the base of their tails. In addition to traditional spinner patterns wet spinner impostors should adorn the fly box. Many spinners end up beneath the surface either exhausted by the rigors of egg laying or those species such as Baetis that deposit their eggs directly onto substrate vegetation and debris. Once the mating and egg laying is complete females and males soon die, their roles complete. Mayfly adults exist for only one purpose, procreation. With over 600 species across North America alone mayflies can be complicated to diagnose from a hatch matching and presentation perspective. Thankfully mayflies can be easily catalogued on a behaviour basis into 4 groups; swimmers, crawlers, clingers and burrowers. Anglers should base their presentation and pattern choices on these behaviour types as it has a definite effect on their overall success. Authors Rick Hafele and Dave Hughes of the highly recommended and informative book, Matching Western Mayflies advocate anglers learn to identify mayflies to the genus level as at this interval both shape and behaviour are a constant. This habit is easier on the fly box, simplifying fly selection for both nymphs and adults. The swimmer family of mayflies is arguably the most important group for fly fishers. At first glance torpedo shaped swimmer nymphs resemble tiny minnows as they dart amongst the bottom vegetation and debris. Swimmer nymph tails are fringed with fine hairs that interlock creating a paddle appendage that when undulated in conjunction with their bodies provides an efficient form of propulsion. Injecting a degree of action into a river or stream presentation can be the trigger to success. Stillwater fly fishers should employ a slow handtwist retrieve consisting of 5 hand rotations punctuated with an exaggerated pause. Expect the take as the pattern pauses and begins to sink. Capable of inhabiting a diversity of habitat, swimmer nymph densities are highest in and around weeds. Swimmer adults feature round heads and loose a tail during the transformation process, dropping from 3 tails as a nymph to 2 as an adult. Most species within this grouping tend to be on the smaller size with adults ranging from #12 down through #18 and smaller. Members of this behavioural group are named for their habit of clinging to objects and surviving within the smooth boundary layer of water that surrounds underwater rocks and clutter. Interlocking gills present on some species aid the clinging process acting as suction cups. Clinger nymphs feature wide flattened bodies and heads with prominent eyes located on the dorsal region of their heads. 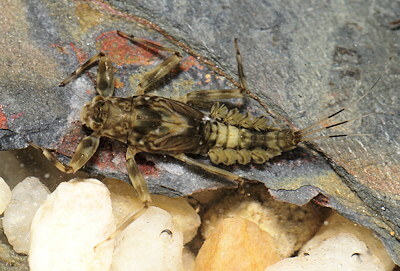 This physique allows clinger nymphs to survive in fast flowing waters, although they are capable of existing in diversity of current types. Clinger mayflies are not found in stillwaters. Feeble swimmers, clinger nymphs knocked from their perches offer an easy meal for downstream trout. Dead drift presentations work best when imitating clinger nymphs. A number of species migrate to slower regions prior to emergence. 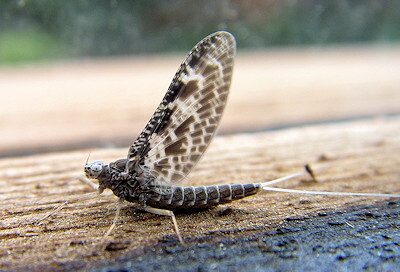 Clinger adults such as the famed Rithrogenia (March Brown) feature distinct 5 segmented legs and heavily veined wings that anglers can use to help identify the clinger behavioural group. Clinger adults tend to be mid sized (#12-#16) and as with swimmers feature two distinct tails. At first glance crawler nymphs appear as though they have been on an aquatic weight training program. Stocky and robust, crawler nymphs creep and crawl along the bottom as their name implies. To the inexperienced crawler nymphs can be confused with their clinger cousins. A close inspection of a crawler nymph reveals the eye location on the sides of its head, a key crawler vs. clinger separator. The vast majority of crawler species live in moving waters although there are some species such as Caenis that inhabit stillwaters. Crawler nymphs do not swim well but can move through the water using a laborious undulating motion. Adults range from a medium size #10 to minute. Tricorythedes or Tricos are often imitated with #20 hooks or smaller. There are a number of important families within this grouping including Ephemerella (Pale Morning Dun) in the west and Seratella (Hendrickson) in the east. Crawler adults have 3 tails and small hind wings. The 3 tails are a key crawler identifier, separating them from 2 tailed clinger and swimmer adults. Burrower nymphs, as their name suggests make a habit of forming burrows within the bottom substrate. Nymphal cycles range from between 1 and 3 years depending upon species. Nymphs concentrate in large numbers in areas with a substrate balance that allows for easy digging but won’t collapse the 4-5 inch U shaped burrows they create. Favoured habitat includes slow meandering streams with silt build up and lakes. Once a suitable region is found burrowers often exist in epidemic populations. The famed Hexagenia is often the subject of mass cleaning efforts featuring front end loaders cleaning up after a major hatch. Nymphs are challenging for fly fishers to see and imitate as many have nocturnal feeding and emergence habits. In some jurisdictions regulations prohibit being on the water when burrowers are active. Burrower nymphs are large, often in excess of 1 inch, and feature a furry grandfather look. The tusk-like mandibles these nymphs use for digging are a definite burrower identifier. The feathered abdominal gills wave and flutter inducing a current that aids oxygen extraction, especially when the nymphs are within their burrows. This feature in part allows burrowers to survive in semi anoxic conditions that their predators cannot thrive in. Burrower nymphs however suffer heavily when exposed to pollution and contaminants. Competent confident swimmers, burrower nymphs undulate their way toward the surface to emerge. Owing to their large size burrower emergence is prolonged. Anglers seeing a burrower emergence for the first time will be stunned by the gargantuan size of the adults. Mayflies are a large, diverse and important family for the fly fisher. We have just dimpled the surface within this column as there are many unique species with specific traits anglers need to be familiar with. Those wishing to expand their mayfly knowledge have a number of excellent resources to investigate. Two personal favourites include, Matching Western Mayflies by Rick Hafele and Dave Hughes and the classic Mayflies, by Malcolm Knopp and Robert Cormier.